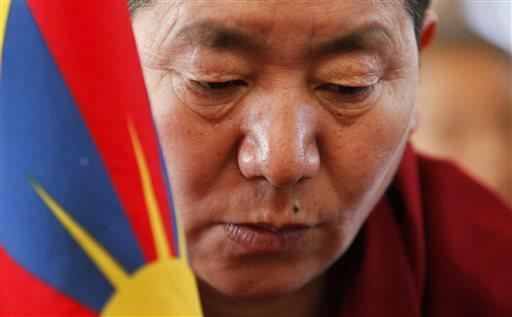 An exile Tibetan prays during an event to mark the 57th anniversary of the March 10, 1959, Tibetan Uprising Day, in Dharmsala, India, Thursday, March 10, 2016. Tibet has long been known as a place of mystique and intrigue for its ancient customs and beliefs. The teachings of Tibetan Buddhism and the Dalai Lama have garnered widespread attention around the world, from the media to Hollywood celebrities. Despite this, the practices of Tibetan Buddhism and the real lives of modern day Tibetans are not well understood. In this episode of America Abroad, the truths beyond the stereotypes, traveling to the Chinese city of Chengdu, near the Tibetan border, to explore the tensions between Tibetan culture and Chinese urbanization efforts; In Dharamsala, India we examine how Tibetans in exile deal with Chinese surveillance while gradually embracing technology; And in the US we visit a Tibetan Buddhist Monastery in upstate New York to learn why Tibetan Buddhism has become appealing to so many Westerners. Oklahoma has one of the largest Native American populations in the United States. By using their right to govern themselves, some of Oklahoma’s tribes have become economic powerhouses, contributing hugely to the state economy. But some tribes are faring much better than others. Which tribes are doing well? Has the political influence of Native Americans – and the treatment of their culture – changed in line with growing economic success? And, are there valuable lessons to be learned from Oklahoma for indigenous peoples in the rest of the United States and around the world?